Nutrition and Whole Soy – Natural Products, Inc. In the same way that functional benefits are closely related to the oil and protein, the nutritional benefits of whole soy ingredients are also related to the oil and protein. By leaving the oil and protein virtually intact, whole soy ingredients retain the maximum nutritional value of the original soybean. Soybean oil is rich in polyunsaturated fatty acids, including the two essential fatty acids, linoleic and linolenic, that are not produced in the body; it also contains no cholesterol. Whole soy ingredients may contain 8% up to 25% oil, depending on the processing. Use of a whole soy ingredient may allow food manufacturers to cut down on other less desirable (or more expensive) fats and oils. Most varieties of soybeans contain approximately 38-42% protein. 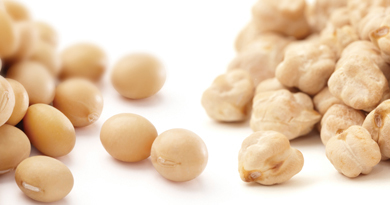 Depending on the processing, whole soy ingredients may contain 38% up to 55% protein or more. Soybeans are generally recognized as a source of complete protein, meaning that soy protein contains all the essential amino acids that the human body requires. The amino acid profile of soy protein is nearly equivalent in quality to meat, milk and egg protein. For this reason, soy is one of the best sources of protein for vegetarians and vegans. Whole soy, because of the low levels of processing involved, contain some of the most unmodified and maximally nutritious proteins available to bakeries and health food manufacturers. Many of the commodity soy ingredients as well as concentrates and isolates are processed using solvents, acids, and chemicals. These processes are generally recognized as safe (GRAS); however, ingredients made using these processes cannot be labeled as “organic,” and it’s a stretch to call them “natural.” This means that the most common soy ingredients are not usable by a large and growing segment of the food industry—the natural and organic markets. Whole soy ingredients are very suitable for organic and natural food manufacturers. Because these manufacturers generally maintain strict protocols, most whole soy ingredients are made with non-genetically modified (non-GMO) varieties of soybeans. This adds a little cost but ensures manufacturers of the quality and traceability of the grain.